Bring beauty to your garden with this curated selection of classic flowers. And when an occasion calls for a bouquet, skip the grocery store and cut an arrangement from you own backyard blooms. (Centaurea cyanus) This easy-to-grow, self-sowing annual bears consistently true-blue flowers that bloom throughout the growing season and are ideal for cutting and drying. This popular cottage garden plant grows 2-3' tall and was brought to America from Europe in the 17th century. 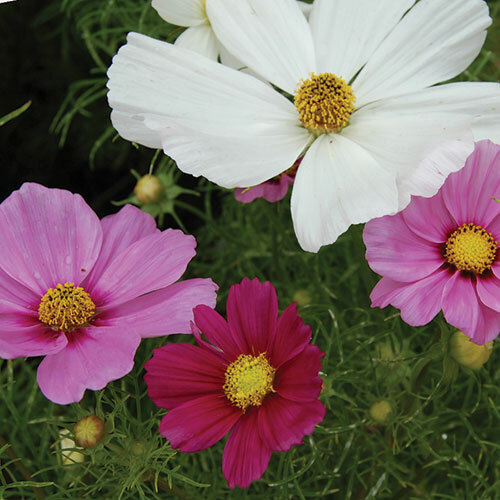 (Cosmos bipinnatus) One of the earliest-blooming cosmos mixtures, this annual is a great choice for northern gardeners. An All-America Selections winner in 1936, this longtime garden favorite produces large, sturdy plants adorned with ferny foliage and flowers in a wide mixture of colors, from white and pink to cerise. An excellent cut flower. Half-hardy annual, 4-5' tall. 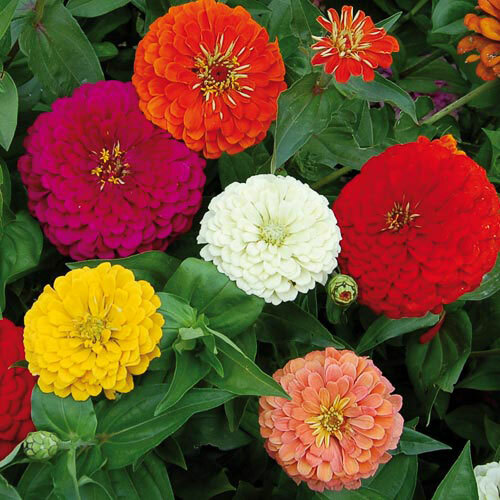 (Zinnia elegans) Magnificent when in bloom and easy to grow, this beautiful, large-flowered strain of zinnia is from Ernst Benary, one of the oldest German seed companies (founded in Erfurt in 1843). Its fully double blossoms measure 4-5" across and come in a wide array of colors. The long stems of this annual make it ideal for use in arrangements and bouquets. Annual, 3-4' tall. (Antirrhinum majus) Robust, scented flowers in an abundance of colors harken back to old-fashioned annual cutting gardens. 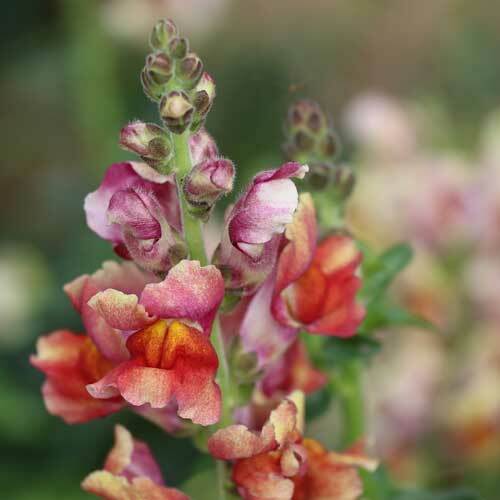 The undeniable vintage charm of this semi-dwarf snapdragon, which grows from 18-24" high, enlivens garden beds and borders, as well as bouquets. Annual. 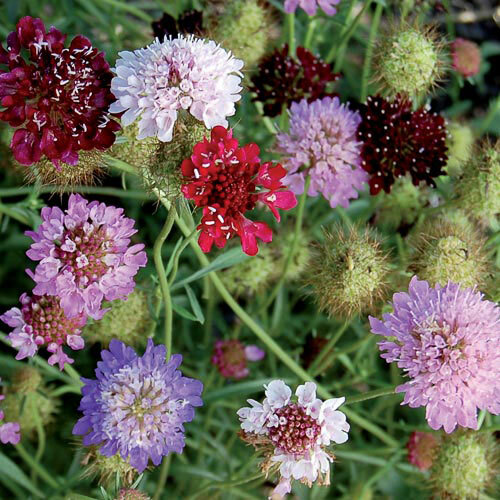 (Scabiosa atropurpurea) Mixture of white, blue, maroon, and red. Great longlasting cut flower. Benefits from partial shade in the South. Sweetly scented blooms attract many butterflies and hummingbirds. Annual, 24-30" tall. 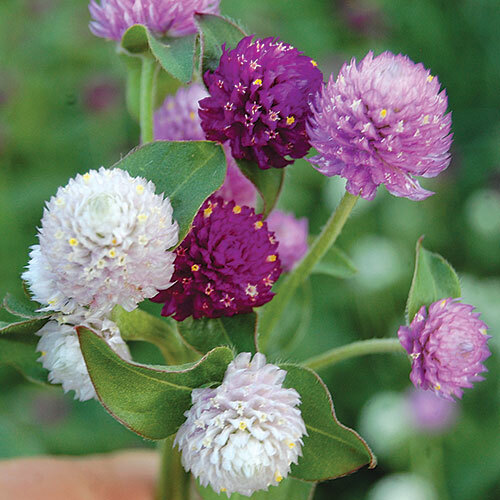 (Gomphrena globosa) While native to Brazil, Globe Amaranth thrives almost anywhere. A balanced mixture of five to seven colors promises to attract a multitude of butterflies to any garden. 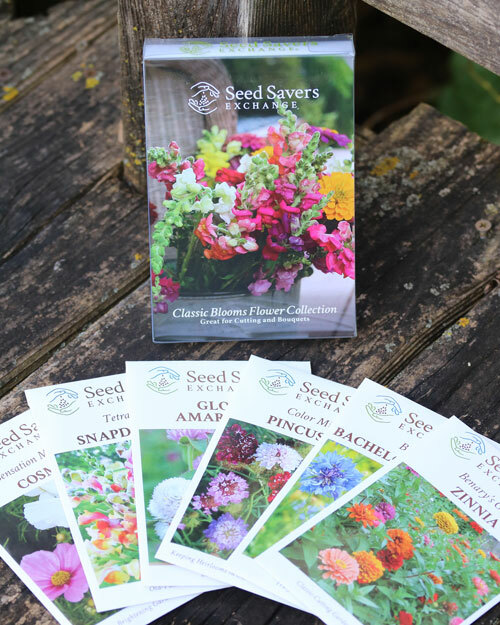 Extremely easy to grow from seed and exceptionally productive, it makes an excellent cut flower for both fresh and dried arrangements. Half-hardy annual, 24-30" tall.